In light of Turkey's Prime Minister Binali Yildarim saying there was "almost no doubt" Saturday's bombings were carried out by the Kurdistan Workers' Party (PKK), WION publishes an interview with Cemil Bayik, one of the organisation's founders and leaders, and one of Turkey's most wanted men. The interview was taken at the end of October 2016 in Iraq's Qandil mountains, where the group has its headquarters. Many states consider the Kurdistan Workers' Party (PKK) a terrorist group. How do you answer to this? Those who have designated PKK as a terrorist organisation know themselves it is false. PKK is a movement which struggles for freedom, democracy, human rights and the values of humanity. It was included in the list of terrorist groups on the basis of Turkey’s demand. According to article five of the NATO treaty, every country which is under threat from any organisation must be defended by other members, who must act according to its requests. Turkey demanded NATO members to include PKK in the terrorist list and they had to accept. NATO members share many economic, political and military interests in the region and they did not want to endanger these for not accepting Turkey’s request. As PKK we do not regard as ourselves as a terrorist organisation. Turkey has been pursuing a policy of assimilation, a cultural and recently also physical genocide against the Kurds. PKK is a movement which aims to resist against these policies, to defend Kurds and other people against such policies. In doing so PKK does not mean to establish a new state, nor changing the borders nor conquering the land of other peoples. We want Kurds to live on their own lands, to express themselves freely, to organise and practice their own traditions according to their identity. And the same for any other people in the region. US and Europe may claim PKK is a terrorist organisation but the party has never carried any action against the US or Europe, it has not harmed any interest of the people of America and Europe. The inclusion of PKK in the terror list is an injustice, a violation of rights done against the Kurdish people. A coalition force is fighting against the Islamic State (IS), an organisation which is considered terrorist. Many international actors recognised and appreciated the successful fight of PKK against IS, especially in Sinjiar where we saved hundreds of thousands of Yazidi from massacre. If the world now is fighting back IS, it is also because they have been encouraged by the fight of PKK. At a time when everybody run away in front of the flag of the Islamic State, the PKK went to the forefront and fought. It has been well documented that Turkey, which claims that PKK is a terrorist organisation, has been the main force behind strengthening, developing, helping and arming the Islamic State. Even now Turkey intervenes and supports IS. So the main terrorist state which is supporting the terror of the Islamic State is Turkey and we can prove it by looking at what Turkey is doing especially in North Kurdistan, to the Kurdish cities there and what they are doing in Syria and Iraq. Time has come for the international forces to stop calling PKK terrorist. People of Europe know that PKK is a major force fighting against the Islamic State and defending the people against them, especially the Yazidis. Turkey has done worse than what the Islamic State has done in Kobane in many cities in North Kurdistan. I call on people who call PKK terrorist to go and witness what Turkey has done against those cities. What Erdogan has done against the Kurds in Turkey is the same Saddam Hussain and Bashar Assad have been doing against their own people. How come the forces which call them a sponsor for state terror are not calling Erdogan the same? What he has done to the Kurds far exceeds what the previous two have done. Ankara has witnessed two major suicide attacks, in February and March 2016, resulting in the death of 67 people and more than 180 injured. 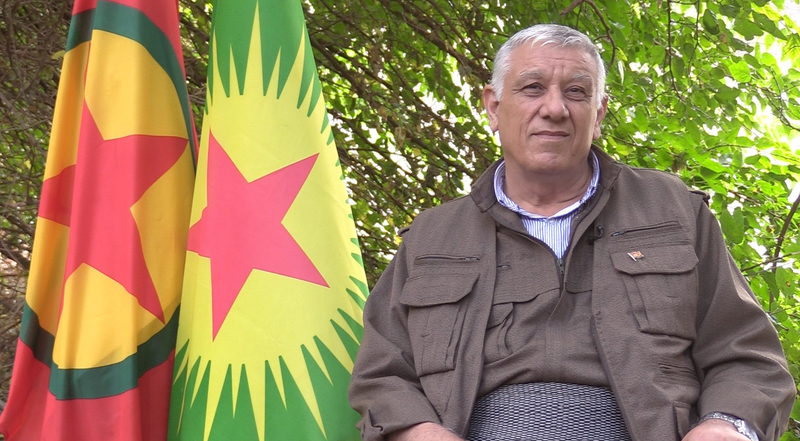 The PKK has been pointed out as the mastermind, how do you respond to these accusations? PKK has claimed responsibility for any action it has done. The secret state agencies active in Turkey have committed many crimes and then blamed the PKK. I call on the international community to set up an independent fact-finding commission to come and make an investigation about who has truly committed the many crimes we have been accused of. During the past two years PKK has committed only one single action in Istanbul which has been claimed by the People Defence Forces (HPG). As PKK we have not done any military action in any big Turkish city. There are several examples about actions committed by groups active within the Turkish State. The most recent is about the killing of two policemen for which the PKK was accused. This murder provided the ground for Turkey to move war against the PKK as a retaliation. We declared we have had no part in that killing but no investigation has been done. These are all measures meant to demonise the PKK. I also want to call upon the international community for a fact-finding commission regarding young Kurds who want to join the guerrillas. We have evidence that when Turkey intercepts them, they are raped, male or female does not make any difference, and we consider this as a crime against humanity. What is your understating of the Turkish willingness to take part at any cost to the Mosul offensive and other anti-Islamic State offensives? At the end of the First World War the issue of Mosul was still an open question. The city was part of the Ottoman territories, but after a treaty signed in 1926 Turkey was forced to withdraw. At that time Mosul was a region which comprehended almost all Kurdistan, to the point that the "Kurdish question" used to be called the "Mosul question". The condition that Turkey imposed while leaving Mosul was that Arabs and not Kurds should have ruled the region, a request which represents the beginning of nearly one hundred years of denial of rights for the Kurdish population. Now a new world war is taking place and the issue of Mosul is again at the core of this conflict. This war, in the Middle East, is between three main actors: global financial markets, nation states and populations. Turkey and Iran are the main forces representing the nation state. Turkey has openly declared its policy to pursue its national interests; Iran does the same, but in a more hidden way. Turkish President Erdogan stated that they have not accepted to withdraw from Mosul voluntarily, a clear manifestation of his willingness to restore an Ottoman empire. This attitude paves the way for a future conflict between Iraq and Turkey. The fight for Mosul is not the fight for one single city, it will determine who will have a voice in the administration of the Middle East. It is a conflict between interests of different regional and international powers and will set the road for the new Middle East. In this conflict, Kurds do not want to continue their life without enjoying a status of legitimacy. This desire extends also to all populations which have to face the same policy of denial. What is the "new Middle East" which could come after Mosul? It is not clear yet on which basis the Middle East will be reorganised. It is clear that the region is undergoing a change and the current conflict will shape it accordingly. Mosul represents the fight of the entire region and it will not end easily and soon. It may open the way to new sectarian conflicts which could last long. In order to understand the present situation, culture is what matters the most. Religion is one of the parameters of the western Asian culture and a clear understanding of its role within the communities is fundamental. When we talk about religion, one of its main characteristics is to pay allegiance and this paves the way for dogmatism and conservatism in the Middle East. It prevents making new developments and progress because it makes mandatory to pay allegiance to different structures. Without questioning this culture of allegiance, it is impossible to bring change in the Middle East. Reform and renaissance are based on negotiation, discussion, controversy and criticism. If one wants to bring change in the Middle East it is imperative to go through such reform and renaissance process. As PKK we believe that change in the region can only happen by enhancing the struggle for the freedom of women and the Democratic Nation. For us, these are the two bases to bring enlightenment in a new Middle East. Given the many sectarian actors fighting against the Islamic State, will Iraq survive as a united country or will it become a confederation of states based on religious beliefs? Even if the Islamic State ends, sectarian conflicts will be even more dangerous. There are two main hegemonic powers competing against each other in the Middle East, Iran and Turkey. Iran supports Al-Hasd Al-Shaabi (the mainly Shiite paramilitary forces) and Turkey is supporting Al-Hash Al-Watani (a mainly Sunni paramilitary group). Iran aims to create a Shiite belt extended till Lebanon and Turkey, with the support of Saudi Arabia and Qatar, and using the Islamic State wants to establish its own new Ottoman hegemony. Sectarian violence leads to disintegration and division within the society and create lasting hostilities between different communities, bringing a lot of ruin and destruction among the people. The notion of Democratic Nation is a cure for this. It relies on unity between different religions and ethnic identities; only through implementing Democratic Nation it is possible to hold different entities together. We must insist on this concept to prevent sectarian conflicts in the region. The idea of Democratic Nation is gaining ground in Iraq and Syria, we have to develop it more if we want more freedom, unity, justice and equality for the people of the region. Kurds should not take part in any sectarian conflict. There are different religious identities among Kurds and the only way to avoid division and sufferings is to stand against sectarian conflicts and work for the unity of all ethnic groups and religions. Only through that, Kurds will be able to defend themselves and the peoples of the Middle East. Sectarian conflict is a threat for the future of Middle East. You have long been fighting for Kurdistan, the land of the Kurds. Isn’t this a sectarian struggle itself? At the present time, we have no aim of creating an independent Kurdistan. If the Kurds, in every part of Kurdistan are allowed to enjoy their democratic rights, the Kurdish question will be solved. Different Kurdish communities have their own peculiarities; if the Kurdish question will be resolved democratically in every country that will lead to the ultimate solution of the matter. This exactly is what we mean with the concept of Democratic Nation: an entity which does not deny to any people their rights. We want the same also for other peoples. Democratic Nation does not mean setting up a separate nation for the Kurds, it means implementing notions such as freedom, democracy, brotherhood and justice among different peoples. Whatever the PKK wants for the Kurds, it wants it for other people too. We are no longer fighting to create a separate state, borders are losing their meaning. The European Union is a sort of confederation of states where borders have not the same meaning as before; we want the same model for the Middle East. A region where borders will no longer be a problem for the unity of the people. We do not intend democracy as the rule of majority over minority. It is instead a matter of rights. Every religious or ethnic group should be able to enjoy its own rights, irrespective of their number. This is the pillar of Democratic Nation.